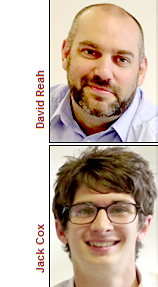 In the UK, consumer insight specialist Engage Research has expanded its Quant team with the addition of three new consultants: David Reah, Sandra Saadi and Jack Cox. The Putney, London-based firm, which was founded in 2005 by a team of former Research International directors, offers a wide range of techniques with particular expertise in innovation, consumer and market strategy, brand and communications, pricing and conjoint research. Reah joins from Ipsos ASI, where he worked across categories such as hygiene, mobile communications and automotive. He previously spent four years at Millward Brown, working on national and international accounts. His background is primarily in brand and communications tracking but with additional experience with copy testing, campaign tracking and ad hoc projects. Prior to entering the market research sector, Reah gained experience working in the hospitality and entertainment industries, and Engage Research Director Lyndsay Peck says he 'brings a different and distinctive point of view' to his new role. Trilingual consumer analyst Saadi joins as Research Manager, following spells working at TNS International Research in London, GMV-Conseil in Paris, and Orange France. Finally, Jack Cox, who has joined as an Assistant Research Executive, has recently returned to the UK after working in Hong Kong for the past year. A graduate in Politics & International Relations from the University of Bath, Jack previously spent a year with The Walt Disney Company's EMEA Market and Brand Research team.